Today’s guest is children’s author, Pam Kelt. Welcome to Strands of Thought, Pam! Can you tell us a little about you, please? With a background in journalism, languages and educational publishing, it was inevitable that I would eventually say to heck with a career and try writing for myself. After a few years of trying out different styles, I landed six book deals in as many months and declared myself reinvented. Just as well, as it’s the ideal way to combat empty nest syndrome now that my daughter is at the University of Edinburgh doing History of Art. Three titles are for adults (Dark Interlude and Half Life with MuseItUp and Tomorrow’s Anecdote with Crooked Cat). Botanical mystery The Lost Orchid (YA/NA) is scheduled for an autumn release at Bluewood Publishing, along with two teen fantasy adventures, Ice Trekker and The Cloud Pearl, part one of Legends of Liria (both with MuseItUp). I now write full-time. I live in leafy Warwickshire, England, with my academic husband Robert (with whom I collaborated on Half Life, a ‘noir’ thriller set in 1936) and our two daft dogs. My favourite pastimes, apart from writing, are watching movies, trying not to overwater my windowsill orchids and keeping up with best teen fantasy fiction around. Ha ha! I live in the high desert; I don’t think it is possible to give our houseplants too much water, it is so arid here. Tell us about your most recent novel, Pam. 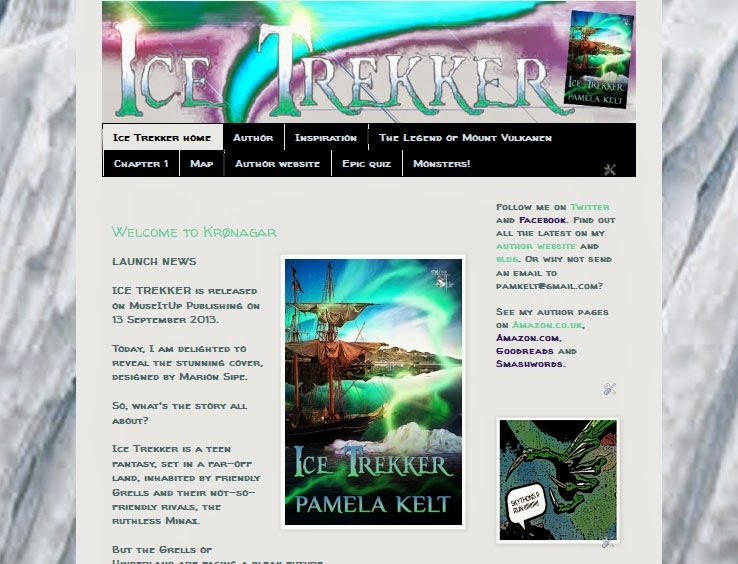 Ice Trekker is a teen fantasy, set in a far-off land called Krønagar inhabited by friendly Grells and their not-so-friendly rivals, the ruthless Minax. It’s a fast-flowing adventure, intermingled with myths, monsters and mayhem. It’s aimed at the tween/teen audience and hopefully would appeal to boys and girls. 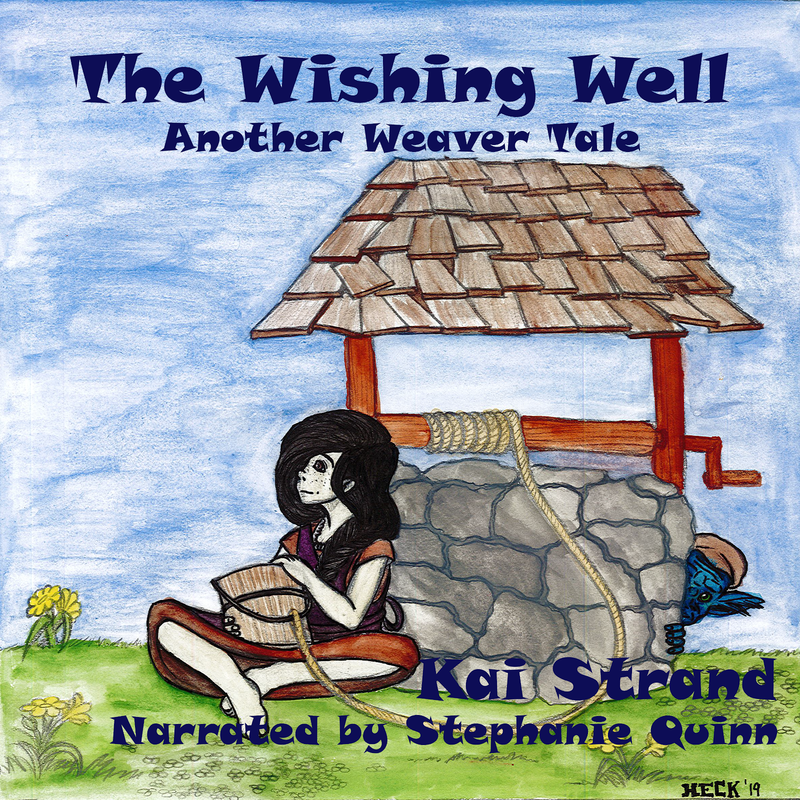 Although set in a mythical past, the story has a modern twist. Supplies of Blackfrost, the one remaining fuel source, have run out, and the Grells of Hinderland are facing a bleak future. Food is scarce, jobs are hard to find and worse … the greedy Minax are poised to invade from the south. For the sake of his family, young Midge leaves home and treks north to the frozen wastes of Krønagar, an uncharted land to the north, in search of work. 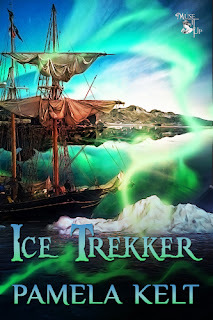 Set upon by thieves, he ends up as dogsbody on the Ice Trekker, a small, shabby cargo vessel that runs into trouble from the start. But Midge soon discovers that the Ice Trekker is not what it seems. The crew has a secret mission to save the Grells – and Hinderland – from doom. Trapped by ruthless Minax, he and the crew end up risking all in a desperate battle for survival as they take on a mysterious quest in the icy wastes of Krønagar. Pam, your book sounds so exciting and the setting unique! Who do you recommend read your book? Ever since my daughter reintroduced me to reading, via JK Rowling, I’ve been addicted to teen fantasy books. Am I allowed to do my three favourites series? Septimus Heap, Angie Sage - whimsical yet epic, a series to rival Harry Potter, with charming apprentice Septimus and his friends, family and foes. My fountain pen. I still like to plot out books the old-fashioned way. The online Collins dictionary. It never hurts to look things up. My laptop. My virtual window on the world. Walk my two lovely rescue dogs every day. We’re lucky in Kenilworth to have plenty of green parks and deep woods, full of good stuff like muddy pools to wade in, sticks to throw and squirrels to chase. The dogs have a great time, too. Read! With ebooks, I read so much more, from teen fantasy through to the grisliest Nordic Noir. I find myself getting to appointments early so I can sneak in some extra chapters. My first super hero is a heroine, disguised as a hero. Her real name is Deryn Sharpe, an orphan who assumes the identity as a boy so she can join the British Air Service in Scott Westerfield’s amazing book Leviathan. She’s as feisty as Amy Pond (Doctor Who’s former assistant) and equally Scottish, mercurial, quick-thinking and loyal to the core. A brilliant heroine. I’m a recent convert to Percy Jackson, from the Rick Riordan series, especially in the latest movie, The Sea of Monsters. I love the fact that he’s flawed and conflicted, struggles with adolescence while being hassled by gods and mythological creatures 24/7, but manages heroically to do the right thing and still win. What a terrific role model. Finally, Sherlock Holmes in all his guises, from Basil Rathbone through to the modern Johnny Lee Miller. Conan Doyle miraculously created this character, an astonishing mix of cleverness and eccentricity, to form one of the most fascinating characters in literature - even though he tried to kill him off! Pam, where can our tech savvy readers find you online? Follow me on Twitter and Facebook. 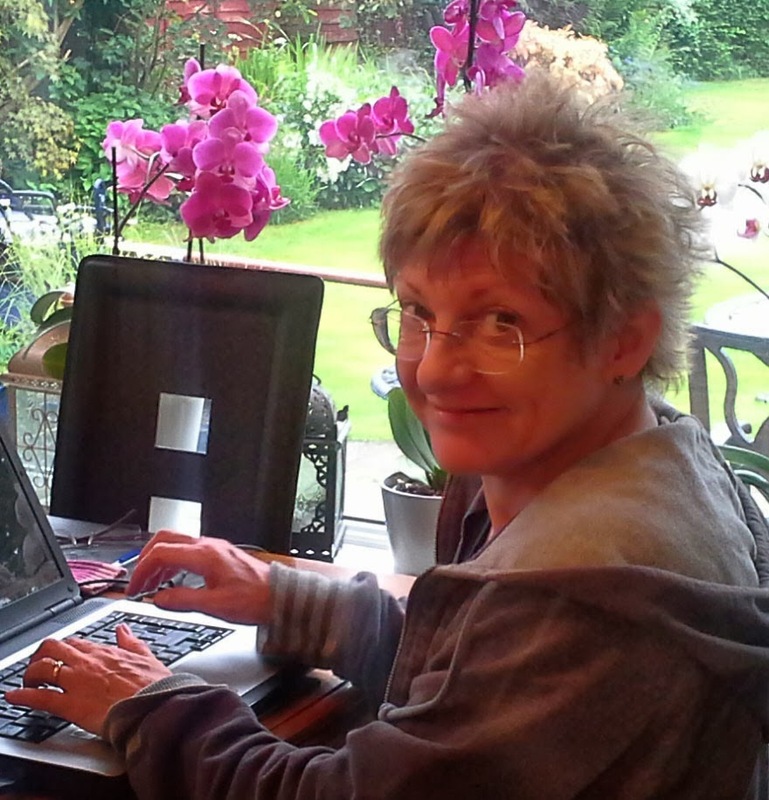 Find out all the latest on my author website and blog. Or why not send an email to pamkelt@gmail.com? See my author pages on Amazon.co.uk, Amazon.com, Goodreads and Smashwords. 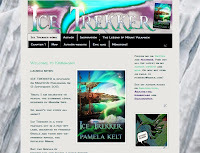 Finally, here’s the companion blog to Ice Trekker. Thanks for charming us on this week’s Three Times A Charm. Best of luck to you and your books. Enjoyable interview Kai and Pam! Best wishes on your books. Thanks, Susan! I love talking to people in the business about what they do! Had to smile when I saw you escape to appointments early to read. I'm guilty of the same-- I had weekly dr. appointments last year (before my baby was born), and was disappointed each time he called my name. Good luck with Ice Trekker and all your other works! Good of you to stop in, Loren! If you didn't see the message to you over on Suzanne de Montigny's blog, be sure to hop on over.